But let's examine this more closely and see why I consider it to be gambling and yet still a viable business. In order to make a comparison between day trading and gambling I'm going to broadly define 2 types of day trading and 2 types of gambling and use examples for each. For my gambling choices I take the casino games of roulette and blackjack because I feel that more people reading this article will be familiar with these two games of chance than any others. (You may be a poker player and that can be substituted for blackjack.) 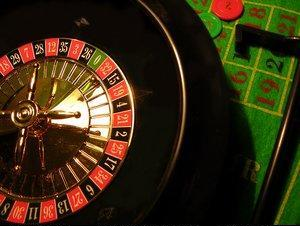 Roulette has fixed odds of winning and a fixed payout. 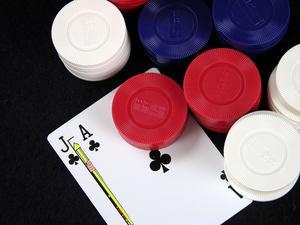 Blackjack has variable odds of winning and a fixed payout. For day trading I chose the mini-sized Dow ($5) Futures (YM). This instrument has variable odds of winning and trading it can be structured such that it has a fixed payout similar to blackjack and roulette. I also define two day trading methods in order to make the comparison. The first day trading method is called random and using this method both direction and time of entry is randomly chosen. The second day trading method is called signaled and using this method both the direction and time of entry is based on a predefined signal. Both methods of day trading use a 20 point target and stop. The odds of the outcome are fixed for roulette and the random method of day trading. The odds of a win or loss with the other two are variable. The roulette table has a 0 and a 00 and the numbers 1 to 36. That gives us 38 different numbers that can result in the spin of the wheel. The odds of any one of these numbers coming up is 1 in 38 which is 2.63%. The random method of trading has a 50% chance of the stop or target been reached given that the stop and target are the same distance apart. Although this statement is true this wouldn't work in practice because of the type of entry (at market) and the nature of the bid/ask price. We also need to take commissions into account - this is dealt with in the payouts. The problem we have with entering a random trade is that it has to trade through the target price in order to fill the target but only has to touch the stop price to trigger a stop. Let's take a look at an example to clarify this. The example assumes that the bid/ask spread is always 1 point. 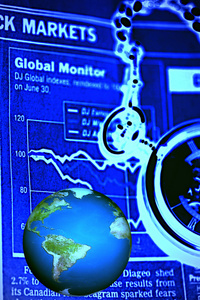 Let's say that the YM is trading at 10440/10441 bid/ask. Our random method calls a buy so we go long at 10441. Our target is 10461 and our stop is 10421. 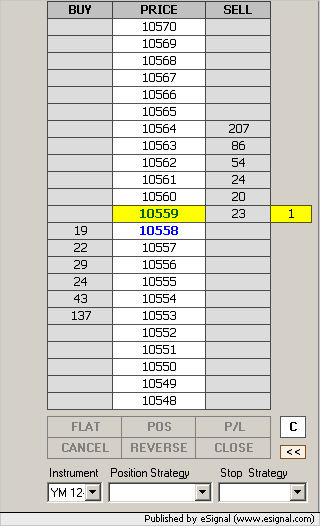 The target is reached (or rather the target is guaranteed) when the bid/ask pair is 10461/10462. We need the bid to be 10461 or higher to be able to sell and close out our long at the target. This means that the bid/ask pair needs to move 21 points up in order for us to reach the target. On the other hand, our stop is executed when 10421 is touched and this will happen when the bid/ask pair moves down to 10421/10422. Once 10421 is touched we execute a sell and close the trade for a 20 point loss. This means that the bid/ask pair needs to move 19 points down in order for us to close the trade at a loss. For roulette we will only be looking at the payout on the colors which is 1 for 1. 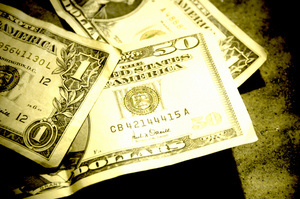 For blackjack we will ignore the bonus payouts for blackjack itself and so also assume a 1 for 1 payout. 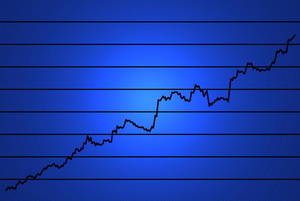 For both our day trading methods we also assume a 1 for 1 payout. We risk a 20 point loss for a 20 point gain. 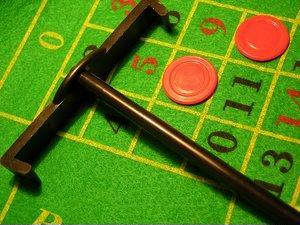 We make this assumption in order to make the comparison to our casino games. There are no transaction costs to casino gambling but in day trading we face commissions in the form of brokerage fees. Our example uses the YM which trades at $5 per point. If we assume that roundtrip commission is $5 per contract (which is not an unfair assumption) then we can translate our commission costs into 1 point per trade. This changes the payout for our day trading methods to 19 points for a win and 21 points for a loss. So is day trading gambling? I'd like to focus on two words that came under the definition of gambling at the beginning of this article. They are "uncertain outcome." I don't think that anyone reading this article will deny that there is an uncertain outcome in both a play at a table in the casino and any one trade. Even if red came up 20 times in a row on the roulette wheel we know that the chance for red to come up on the next spin is 47.4%. The roulette wheel has no memory. The word gambling is often associated with the taking of a disproportionately higher risk than the reward associated with that risk. "I wouldn't short the YM here, that's just a gamble." This sentence can be roughly translated into "I wouldn't short the YM here, there is no high probability setup here." When you walk into a casino and sit down at the roulette table, who is gambling? Is it you or the casino? In my opinion you both are. It's just that the odds of winning are different for the two of you. If you bet $1 on red on each spin of the wheel then you have a 47.4% chance of winning and the house has a 52.6% chance of winning. You should expect to win $474 and lose $526 for every thousand spins of the wheel or a net loss of $52. For you this is a gamble, for the house it isn't. This is because you are taking a disproportionately higher risk than the reward associated with that risk. The house is not. I would like to take this opportunity here to point out that in theory you can still win at this game by using the martingale system of money management. Each time you lose, you double the bet on the next spin until you win. This system can be modified by doubling the bet of the last loss and adding one base unit. This means that you will make one unit ($1 if that's your base) for each spin of the wheel. This is only possible in theory because of two limiting factors: 1. You need unlimited capital to carry your through your draw downs and 2. The casino has a limit on how much you can bet on any one spin. I mention the martingale system here and site this theoretical example to highlight the importance of money management in games of chance or rather in games where the odds of success vary. This brings us on to blackjack. The odds of winning any single one hand in blackjack vary for each hand that you play. The more high valued cards that are left in the shoe the higher the chances of the player winning a hand and the lower the chances of the house winning the hand. Professional gamblers know this and for that reason they don't play the fixed odd games that are against them but the varying odd games such as blackjack and poker. That's also why the casinos allegedly blacklist professional gamblers. The casinos aren't interested in people that can make money out of them. They are only interested in the gullible punters. By card counting the professional gambler knows when the odds of the shoe shift in his (or her) favor and will then increase the amount that he bets. The professional trader does the same thing. When the odds shift to his favor he trades larger size. The random day trader does not stand a chance in this game. For each trade that he places the odds through the bid/ask spread nature of the market and the commissions will make it a losing game for him. Trading is not a zero sum game. Trading is a negative sum game. At the end of a trading day if you add together all the money that the winners have made and take off all the money that the losers have lost you will end up with a negative figure. That negative figure represents the commissions paid. This does not take into account the fixed costs (data feeds, computers etc.) which further reduce profits. The random day trader may survive for a while using the martingale system but nobody has infinite capital and the house limit is implemented by lack of liquidity in the markets. The signal day trader is using a signaling system that has a higher probability of success than a 50/50 outcome. The probability may only be a few percentage points but applied time and time again over a period of time will cause the accumulation of capital. The percentage needs to be high enough to 1. cover commissions 2. cover other trading costs 3. provide enough profit for capital accumulation and (in some cases) 4. provide an income stream for the trader. The professional day trader and the professional gambler are doing the same thing. They wait for the odds to turn to their favor and then execute their trades and bets. They allocate more money to higher probability outcomes and less or no money to the lower probability ones. The entertainment gambler plays the roulette table for entertainment's sake and should know that in the long run they will never win. The professional gambler reverses the odds of success and sticks to a tight set of rules. The seasoned trader is the casino and not the player. He only plays the high odd hands and over time will come out ahead. The inexperienced trader often thinks that he always need to be in the market and will trade for the sake of it. We have all been guilty of placing boredom trades. If you find that you can watch the screen all day and not make a trade because you have not seen a valid setup then you know that you're starting to master yourself. Don't confuse not making a trade with being gun shy and not being able to pull the trigger though. Hopefully I have demonstrated here that there is no difference between playing a casino game and day trading the markets. Notice that I did not say between gambling and day trading. It's a matter of semantics. If you define gambling as taking disproportionately more risk than expected reward then you will probably agree that you can gamble in both the casino and the markets. What I hope you take away from this article is that you're only chance for survival and profit in a game with an uncertain outcome is to only play the game when the odds are in your favor. 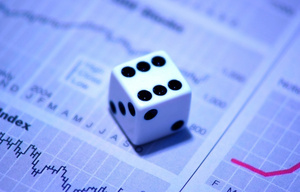 The more the odds are in your favor the higher the percentage of your capital that you can bet on the uncertain outcome. Remember that even a strategy that's right 90% of the time will show you a losing trade every 10 times. A comparison of trading and poker.